Title [Archer Mrs. Groff Bryant holding a bow and arrow and pulling back the bow string] [graphic]. 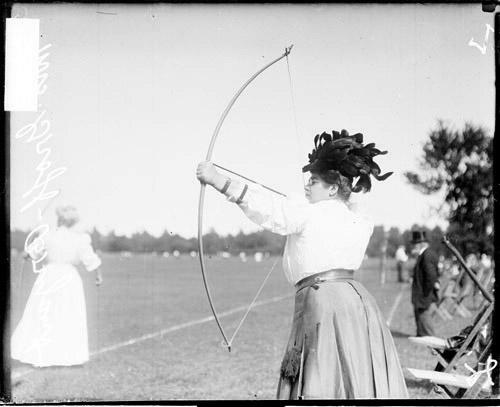 Collection summary Informal three-quarter length portrait of archer Mrs. Groff Bryant holding a bow and arrow and pulling back the bow string, standing on an archery field in or near Chicago, Illinois. A woman and a man are standing in the background. Washington Park (Chicago, Ill.) 1900-1909.